Fitting parameters are unique to each patient. Fitting parameters, combined with SEEMAX Master customized design, ensure the highest level of comfort without compromise. Many factors can affect the value of the ideal variable inset. Presio Master & Seemax Master take into account the far vision power and the pupillary distance when calculating the ideal inset. However Seemax Master goes one step further by allowing ECPs to customize the inset value to the wearers’ exact working distance, ensuring a perfect match. 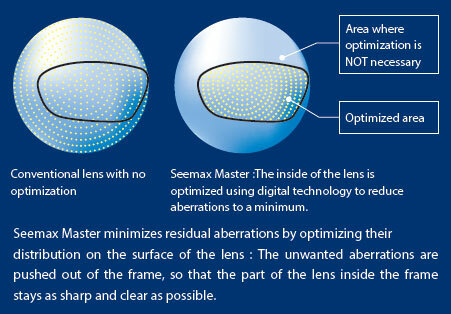 Seemax Master uses a Nikon exclusive frame parameter to further improve the optical quality and reduce aberrations : the frame shape. While the frame shape is usually needed to optimize a lens thickness, Nikon goes further and uses this parameter to dramatically reduce aberrations. This is the same technology that is used for Seemax Single Vision.